Back in the day (like 2000-2009ish) it wasn’t unheard of to have fans who liked the Cloverway dub better than the DiC dub. Usually because the Japanese sub wasn’t necessarily accessible and there wasn’t a “more faithful dub” and those who liked the Cwi era appreciated it for sticking closer to the Japanese version. Although the acting and the inconsistencies and slang was always cited as a negative against them. I don't like it quite as much as the DIC dub or the dub of the movies, but I still enjoy the CWI dub (more so their dub of SuperS and the later half of S; the first half of S is...rough). I like that it was uncut, that they used the original score (I just wish they'd released the vocal songs!!! ), that a lot of the one-off characters kept their Japanese names more or less, and a lot of the voices were good. If only they hadn't been rushed and Nicole hadn't been allowed to take over as director, I think it could have been a really solid run. I recall them really liking giving the characters English first names but keeping the Japanese surnames. Also Amy gets her Japanese surname back. All 4 of the Outers kept their surnames (and Hotaru her given name) and Serena got to keep her last name. , and a lot of the voices were good. If only they hadn't been rushed and Nicole hadn't been allowed to take over as director, I think it could have been a really solid run. Long answer: Back in like 2000, some fans of the Japanese version PREFERRED it over the DiC dub because it wasn't heavily censored and had the original music (the folks on SMUncensored even ended up preferring Linda Ballantyne over Terri Hawkes), but they still largely hated it. Fans of the DiC dub hate it because it was a big departure from that version in terms of editing, and all the cast changes. There's really no reason to watch it now because most of the good things in the Cloverway dub were done far better in the Viz dub of these episodes (and the Viz dub is hardly Bebop itself). It's just an artifact now, and only worth watching to hear Stephanie Beard as Rini and Susan Roman and Katie Griffin reprising their roles as Jupiter and Mars (and not nearly as well as before). However, the DiC dub still has its admirers for its solid (for the time) voice acting, distinctive charms, and nostalgia value. Nobody has nostalgia for the Cloverway episodes. Even when I was 6 years old, I thought Serena sounded weird in those episodes. 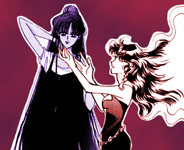 And Jennifer Gould’s excellent take on Hotaru and Saturn. And Jeff Lumby’s damn good Tomoe. And Miss Bishop turns in a perfectly respectable performance (as always) as Kaori Knight even if its not quite as good as her Zoycite or Emerald. 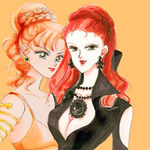 And hell Emilie Barlow was a really good Minako better than Stephanie and Cherami actually.
) Fish-Eye, Zirconia, and Liza Balkan. The directing obviously had a negative impact on the acting particularly in the first half of S but the cast was talented enough (for the most part) to mostly come out okay.
. Nobody has nostalgia for the Cloverway episodes. . I was going to echo a lot of this. I especially got to hand it to Jeff Lumby because he goes from deliciously evil crazy mad scientist to doting DILF like nobodys business. I’ll also add I don’t think Ballatyne was bad per say just horribly miscast and badly directed (considering her direction was “Be Terri Hawkes) her Serenity is reaally really good. She’s obviously more suited for more regal and mature characters. Well I don't like as much as did, but I still like it. I'm a fan! In fact, I'm one of the rare Sailor Moon fans who has more nostalgia for the Cloverway dub than the DiC dub. My memories of the DiC dub are really faint. Outside of having the Mercury and Mars debut episodes on tape, I only saw the DiC dub once when I was really young. (pre-school-Kindergarten) But I remember S and SuperS really well, due to a combination of being older when I saw it, having a lot of S episodes on VHS, and seeing each episode at least twice due to the Toonami reairing. I had the last four episodes of the SuperS dub on tape, so I watched those a lot (until I got the DVDs) and definitely have nostalgia for them, but even though I was also a bit older when the S and SuperS dub came out and watched them every day Toonami aired them, I don't really remember them much from that time, and I'm so used to watching the uncut DVDs that it was only recently when someone posted some clips that I was reminded the TV edits had transition FX. (I don't think they used them in the final episodes of SuperS, or else I would have remembered them for sure.) The only S episode I remembered vividly from the TV run was the last episode with Mimet because I kept thinking how great it would be if they did an episode/special/movie where someone plugged that device back in and Mimet returned, looking for revenge. There's a special place in my heart for the CWI dub. As a kid I remember going online and hearing how we'd never get anymore episodes of Sailor Moon, then all of a sudden the movies quietly came over, and then Cartoon Network randomly advertised new episodes in June 2000. I was 10 when the CWi dub came out, and I really enjoyed it. I liked Linda a lot, and I still do. I really enjoyed that they used the original music, and dubbed the insert songs. I really liked that they weren't *too* afraid of Japanese cultural references. If they didn't rush the production, and if Nicole wasn't involved, it could've been great. The first few episodes of S I thought were great. Some rough acting from the newcomers, but overall pretty enjoyable. "Driving Dangerously" is still one of my favorite episodes from the entire dub. There was a painful dip in quality for a while, until the time Mimet appeared. I also thought SuperS was a pretty solid dub aside from the occasional bad voice, and weird changes ("Dead Moon" to "Dark Moon", Zirconia's gender). I also appreciate the CWI dub as a made-for-TV kids dub. It wasn't that horribly censored. They used the original music. They kept a lot of Japanese names. They let characters die, and kept in references to death. They even let a character smoke and blow smoke in somebody's face. It's kind of impressive. The only CWI episodes that didn't use scene transitions were "Hello Darkness, My Old Friend", and "The Sweetest Dream". They completely escaped my notice, then! The only thing from the Pioneer/CWI dub that really puzzles me (and I realize this is a bit o/t) is why they didn't dub the Ami's First Love short and the SuperS special. I wish we knew if they deliberately chose not to dub them, or if they were simply never offered them to dub. Were they dubbed in other parts of the world at the time? Yes, they were. In Italy and Germany. But they apparently were offered separately from the movies. Dubs like the Latin Spanish one dubbed the movies, but not the R and SuperS shorts. With the SuperS tv specials they may not have been offered to Cloverway by Toei. Iirc S and SuperS dubs were announced as one 77 episode package. The SuperS specials along with Sailor Stars may not have been offered. As for Ami’s first love who know either Pioneer didn’t feel like licensing it with the movie or it wasn’t offered to them. And then you have Pioneer’s treatment of the Sailor Moon movies which were released with an uncut dub with the Japanese music mosty intact that dub still used She is the one named Sailor Moon in place of Moonlight Densetsu (which I guess is closer to Moonlight Densetsu than Rock the Dragon is to Head Cha La) but then they released a lightly edited dub with the Dic bgm and insert songs (mostly used) and in general the scripts felt like the DiC dub circa the final 17 episodes of R probably because it used the same Adaptation writer and voice director as those episode. Considering up until recently, only Italy dubbed the specials, I'm pretty sure Toei just didn't offer them. Which is a shame. Yeah, most of the voice actors in the CWi episodes were very good, just poorly directed and in some cases, poorly cast. Linda Ballantyne did do a fantastic job as Serena under the circumstances, but she never should've been cast. Her voice just isn't right for the part. She sounds too deep and mature. Emilie Barlow, Jeff Lumby, Jen Gould, and Kirsten Bishop also turned in good performances, though everyone sounded much more polished in the DiC era. The absolute worst voice was Liza Balkan as Amy, but given Balkan's background as a stage actress, I'm sure it was mostly just her being inexperienced with dubbing anime and voice acting in general. I'm sure she's a fine performer on stage. She was also a miscast because her voice sounded far too old for the character. However, Stephanie Beard and Emilie Barlow were better choices for Rini and Mina than Tracey Hoyt and Stephanie Morgenstern, but even their performances weren't as polished as they could've been under better direction. They're still probably my favorite voices for those characters though. Tracey Hoyt always made Rini sound like an annoying brat, and Stephanie Morgenstern sounded far too mature as Mina, and too stiff for the character's sillier moments. I like Sandy Fox as Chibiusa, but Stephanie Beard sounds like a more natural choice, and Cherami Leigh has always felt like a slight miscast as Minako, but still sounds alright enough. Honestly, most of the Viz cast is like that. None of them are bad choices, but hardly any performance is interesting or outstanding (though there are a few, mostly villains). It's a very routine-sounding dub for the most part. Pioneer/Geneon always entrusted all dubbing to the studios. They had very little input themselves. Most of the credit for those DBZ movie dubs goes to Ocean, who hired their own script writers (Ward Perry, Terry Klassen, etc) to do the script adaptation. The credit for the SM movie dubs goes to Optimum, who had their own writers doing the scripts (Lisa Lumby Richards). Linda Ballantyne did do a fantastic job as Serena under the circumstances, but she never should've been cast. Her voice just isn't right for the part. When Terri became unavailable, I wonder if anyone at Optimum thought to see if Tia Browsh was available. I don't know if she's done any voice acting, but I thought she did a pretty good job playing Serena/Sailor Moon in those live action bumpers for that Thanksgiving marathon. I think her voice would have been a suitable replacement for Terri. The absolute worst voice was Liza Balkan as Amy, but given Balkan's background as a stage actress, I'm sure it was mostly just her being inexperienced with dubbing anime and voice acting in general. I'm sure she's a fine performer on stage. She was also a miscast because her voice sounded far too old for the character. I feel like Liza gets too much hate. She's perfectly fine as Amy. Her performance is a bit wooden, but I think that's the result of bad direction and the actors not having the ability to prepare. Her voice is a little older sounding than Karen's, but I don't think there's a huge difference. Tracey Hoyt always made Rini sound like an annoying brat, and Stephanie Morgenstern sounded far too mature as Mina, and too stiff for the character's sillier moments. Rini was kind of an annoying brat in R, so I thought Tracey's voice fit really well. Mina is a lot more serious in Classic and R, so again I think Stephanie was a good match. I like Stephanie and Emilie a lot too, and I think they happened to step into their respective roles at just the right time to match the shift in the way their characters were being portrayed. I usually agree with you on what you're saying, but after reading this, I checked out some scenes of Liza as Amy just to be sure, and... "Perfectly fine" is a waaaaaay too generous adjective to describe her work in Sailor Moon. I feel like her voice fit Amy, but her acting was just terrible. She had the same problem a lot of the actors had; no experience with voice acting. She just couldn't give a convincing performance. She was also the only actor that was constantly bad throughout the entire dub. Everyone else improved, but she sounded bad the entire time, IMO. Her line delivery was either too stiff, or too Speed Racer. I do agree with you that she was probably just out of her element. I don't think Tracey and Stephanie were bad as Rini, and Mina, but they weren't my favorites. I think Stephanie would've been better voicing a more mature character - maybe Luna, or even Michelle. Their replacements in the CWI dub were probably the only major improvements (I love Linda as Serena, but I wouldn't call it an improvement persee). I think Stephanie would've been better voicing a more mature character - maybe Luna, or even Michelle.